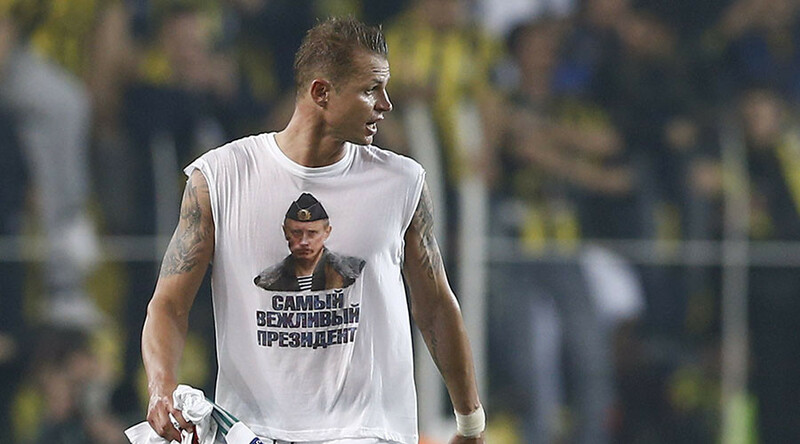 Russian footballer Dmitri Tarasov’s t-shirt tribute to President Vladimir Putin at the end of a Europa League match against Turkey’s Fenerbahce has generated a backlash online. Turkish media even went so far as to block out the shirt’s message in coverage of the game. The FC Lokomotiv Moscow midfielder is facing a possible ban of at least 10 games for backing his president while competing in a sport which regularly sees vulgar abuse openly directed at players and rival supporters from so-called fans. A number of Turkish and international media outlets have labeled Tarasov’s shirt gesture an attempt to provoke Turkey or Turkish fans. Last year, Turkey shot down a Russian aircraft but failed to take any meaningful responsibility over the fatal incident. Turkish newspaper Yeni Safak bizarrely went to the trouble of censoring the apparently offensive image of Putin, who regularly appears unblurred on international news channels around the world. The player himself has responded saying he did not mean to provoke. He told Life News that “smart people” will understand that it was not the intention. Tarasov, who was on the losing side at the Istanbul ground Tuesday, has apparently contravened UEFA’s Article 14 rule on “Racism, other discriminatory conduct and propaganda”. While some have labelled the 28 year old a fashion troll, others think it is a bit of an overreaction to get shirty over the incident. Dmitri Tarasov'un maç sonu formasını çıkardıktan sonraki tişörtü! The relationship between the nations reached a low last November, when a Russian Su-24 aircraft was shot down over Syria by a Turkish F-16 as it was bombing terrorist targets on the ground. The unprovoked attack by the Turkish air force resulted in the death of Russian crew commander Oleg Peshkov. Officials in Turkey claim the supersonic Russian aircraft entered Turkish airspace for a total of 17 seconds. However, Turkish officials did not use a hotline set up especially to facilitate communications between the two militaries before shooting the plane down.